Katinka Hosszu Biography and Family Facts, Why Did She Split From Husband? Home Sports Katinka Hosszu Biography and Family Facts, Why Did She Split From Husband? Talk about leading women in the sport of swimming and the name Katinka Hosszu would be the first to come up. Hungarian professional swimmer Katinka Hosszu holds many world records in swimming, especially in medley events. She has participated in four Summer Olympic events (2004, 2008, 2012 and 2016) and emerged an Olympic champion thrice. She has won the FINA Swimmer of the year title at least four times in 2014, 2015, and 2016. A 7-time long-course world champion, the Iron lady holds the world record in 100 m, 200 m, and 400 m individual medley as well as, 100 m backstroke and the 200 m backstroke both in the short course. No other swimmer in the world, male or female has won at least a million dollar prize money from swimming except Katinka Hosszu. Katinka Hosszú was born on the 3rd of May 1989 in Pécs, Hungary to Barbara Bakos and István Hosszú. She showed passion for swimming from a very early age and was coached by her grandfather László Bakos until she turned 13. Dave Salo became her next coach and soon Hosszu began entering competitions as a teenager and at the age of 15, she won her first medal, a bronze medal in the 400 m medley at the 2004 European Short Course Swimming Championships. 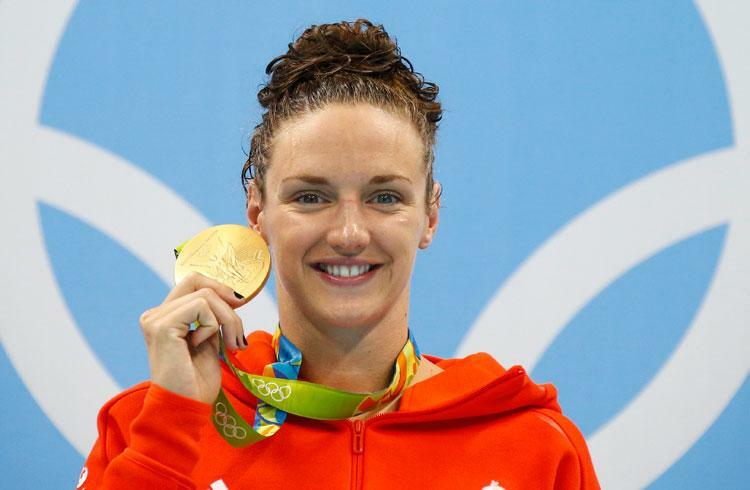 She competed at the 2009 World Championships winning 2 bronze medals in the 200 medley and butterfly. By the end of 2009, Hosszu was named the Hungarian Sportswoman of the Year. Her career enjoyed a steady rise before hitting rock bottom in 2012 when she was unable to win any medal at the 2012 Beijing Olympics, her first Olympics. Head of the Hungarian Swimming Association, Tamás Gyárfás even advised Hosszu to retire but she remained undeterred. Hosszu would later ask her boyfriend, former American professional swimmer Shane Tusup to become her coach. With Tusup, Hosszu was able to revive her career, achieve her dreams of becoming an Olympic and a world champion, breaking and setting many records. She is now coached by Árpád Petrov. Family Facts – Why Did She Split From Husband? Katinka Hosszu was married to Shane Tusup for five years between 2013 and 2018. They had met at the University of Southern California in 2009 when they were both freshmen at the school. They began dating shortly after and in 2012 after Hosszu became frustrated by her average performance at the 2012 London Olympics, she asked Tusup to become her coach. Tusup became Hosszu’s husband in 2013. Their marriage seemed very blissful judging from the many social media posts Tusup made, often gushing about his love for Hosszu. However, in 2017, a year after they had started their own swim club, Iron Aquatics in Hungary, the pair announced that their relationship was facing a difficult time. As a result, the couple attended one of the major swimming awards ceremony in Hungary separately. Her husband Tusup at the time had said that they would work things out, however, they never quite got to the bottom of their problems as things only went from bad to worse since then. Rumors about their relationship swirled around before Hosszu in May 2018 settled it by confirming that she had ceased working with Tusup as her coach, however, she did not speak about their marital status. She made the announcement via her Facebook page, explaining that she and Tusup were unable to solve heir “personal issues.” Tusup who was the administrator of her Facebook would later delete the page, however, Hosszu with the help of activist and women’s rights defender Matan Uziel was able to regain control of her Facebook page where she has over half a million followers. While Hosszu kept her announcement very professional giving no detail away regarding the reason for their split, Tusup went to extreme lengths to wash their dirty laundry on social media. In a lengthy letter posted to social media, Tusup said the reason for the split was Hosszu’s infidelity. He claimed Hosszu had an illicit affair with her training partner, Daniel Dudas. Tusup explained how he noticed an overnight strain in their relationship and how Hosszu constantly blamed it on his character. He concluded his message by saying that he never believed that Hosszu genuinely loved him but only admired his commitment to her career. He said he felt “manipulated” and “deceived.” Hosszu didn’t issue any reply to her ex-husband’s claims. The couple had no kids together.